« ~HOT~ Copper Chef Square Fry Pan with Lid, 9.5 inch $37.97 FREE Shipping! Fall is upon us, and for many, we are already experiencing the cooler weather. The leaves are changing color and falling due to the drop in temperatures, and before we know it, the cold will set in. Windows will be closed, and the heaters will be turned on. Some will have the nice glow and warmth of the fireplace while others use small heaters to warm their homes. Either way, the heat can bring about dry air leading to dry noses, skin, and other discomforts. To combat the dry air that heat causes, use a humidifier. A humidifier adds moisture back into the air preventing the irritation of dry air. Humidifiers can be used to treat dry or bloody nose, cracked lips and skin, sinus congestion and even to keep away colds or the flu. There are several types of humidifiers available, but the most common and effective one is an ultrasonic humidifier. I was recently sent one of these to try and see what I thought of it. 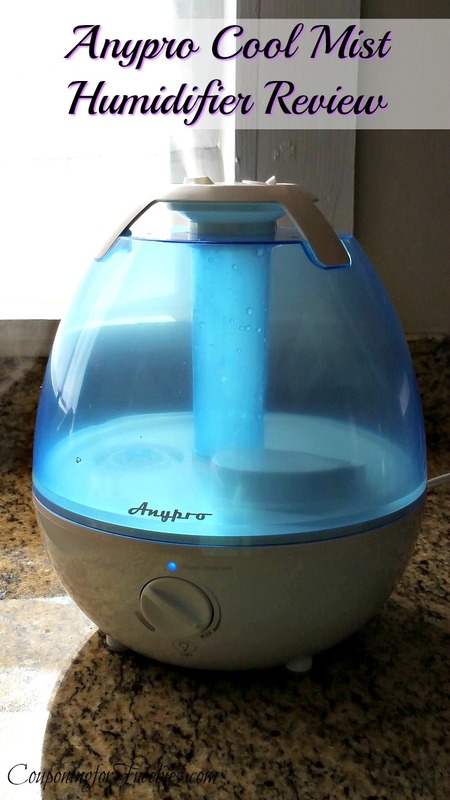 It is a 3.5-liter cool mist humidifier by Anypro and is an ultrasonic humidifier designed in the USA. It puts moisture back in the air with minimal noise and continuous operation for up to 36 hours. Though compact, it can be used for medium to large sized rooms with optimal coverage. Plus I love the fact this is a cool mist. That means if you or someone puts a hand or arm over the mist, you will not get burned. The Anypro ultrasonic humidifier is perfect for use in a bedroom, living room, or office space. The amount of mist can be controlled by a knob on the front, and the mist nozzle can be rotated to change the direction of the mist. Distilled water or tap water is suitable for this humidifier, but distilled is recommended. Next to the mist nozzle, there is a place to add essential oils. However, it does not emit an overwhelming scent. In fact, it has very little smell at all when you use it. I think that is one of the only downsides to this humidifier. This product receives a 4.5-star review rating on Amazon and is backed with the testimonials from satisfied customers. Users remark on the ease of filling the unit with water, the quiet operation, and the appropriate brightness of the night light. Others stated how long the filled tank lasted compared to other humidifiers, and how easy it was to setup the unit once it arrived. I have to agree with the reviews! I have found it super easy to use and fill. And it does last a lot longer then some other humidifiers I have tried in the past. Plus it is SO quiet! Whether you need a humidifier for your bedroom, living, or child’s room, the Anypro cool mist humidifier is suitable for common areas of the home. It’s anti-mold material, special design, and safety features make this a desirable unit for the home. Adding moisture back into the air doesn’t get any quieter or easier than this. So don’t suffer from dry skin or other discomforts this winter, give a cool mist humidifier a try. Right now they are running a sale offer. If you buy one humidifier and use coupon code 4HEG2E4N at checkout to get it for $45.99! Or they are also offering this deal. You can buy one humidifier AND one Essential Oil Diffuser and use coupon code RXG6WQAZ at checkout to get $13 off.